This is my current set up for hay/hay boxes/kitcheny area. They like it and almost always use it for bathroom breaks. Anyone else potty training their pigs? I hate to tell you, but you're not potty training them. You've trained yourself to put potties where they potty the most, and that's a good way to catch most of the output. But you can't train a guinea pig to use a potty. If you've got a cooperative pig, they'll mostly go in one or two places. If they're not cooperative, all bets are off, and they'll go anywhere, anytime they please. That’s the truth! 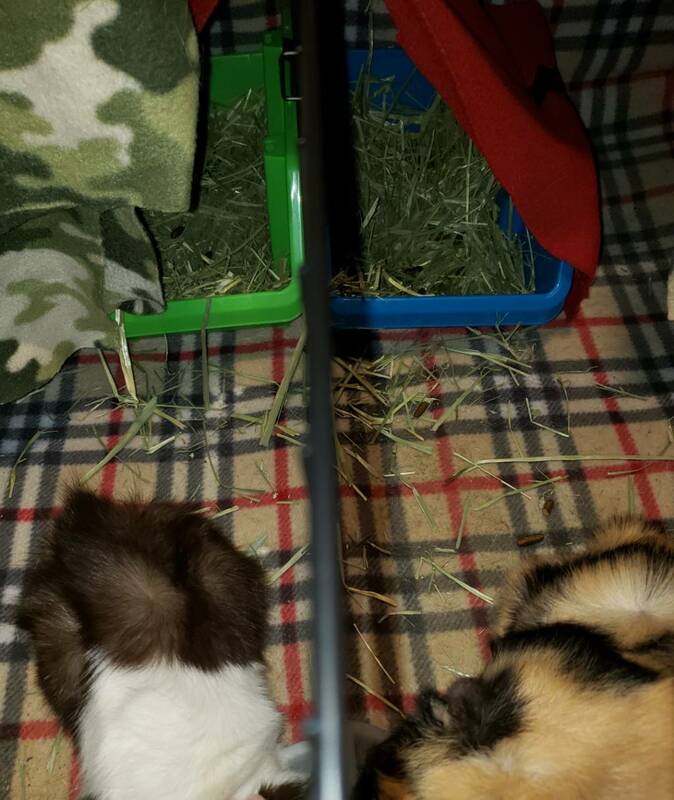 They eat and potty at the same time in the same places so where there’s hay there’s a mess to clean up! Those bins look like the stackable ones from the Dollar Tree. I use those turned upside down for hideys. My Lacey likes to shove them around or hunch her shoulders and drag them like a hermit.